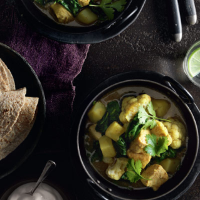 This lovely curry is loaded with warming spices, ginger and garlic, ideal for this time of year. It’s low in fat, too. The key component, cauliflower, contains vitamin C and folate – it’s also a good source of iron. 1. Place the onion, garlic, ginger and curry powder in a mini food processor and whizz to a paste. Spray a large non-stick pan with oil and cook the paste for 5 minutes, stirring. 2. Stir in the cumin and stock and bring to the boil. Add the chicken and potato and cook for 15 minutes. Add the cauliflower and cook for 10 minutes until cooked through. 3. Stir in the spinach, until wilted, then divide among bowls. Sprinkle with coriander and serve with yogurt and chapattis. This recipe was first published in Thu Jan 19 13:42:00 GMT 2012.